The Accidental Locavore should have known it was coming…. I was working on a batch of grilled broccoli from Ottolenghi, the Cookbook, which calls for broccoli to be cooked on a very hot grill pan. 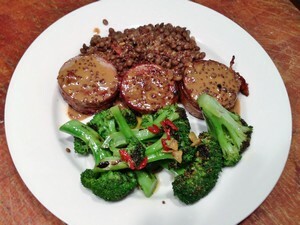 In the middle of balancing the broccoli, searing some rabbit sausage and cooking lentils, the smoke detector goes off. Since ours is hard-wired, that means a call from the alarm company wanting a password before inquiring if the house is indeed burning down. So there I am, desperately trying to get a window open, while balancing the phone, trying to remember the password for the alarm company (which is different from the one that turns the damn alarm off), with a hot and smoking grill pan full of broccoli. This feeds 2 to 4. Steam the broccoli for 2 minutes (I used the microwave) and put it in ice water to stop the cooking. Drain and dry thoroughly. In a mixing bowl, toss with 3 tablespoons olive oil and the salt and pepper. Heat a grill pan over high heat for 5 minutes, until it’s extremely hot. Grill the broccoli, being careful not to crowd the pan (you may have to do it in batches). Turn them so they’re evenly cooked. Put them in a serving bowl. While the broccoli is grilling, heat the 5 tablespoons of the oil, garlic and jalapeno in a small pan over medium heat until the garlic just starts to turn golden. Remove from heat and pour over the grilled broccoli. Serve and enjoy! My verdict: Besides the disaster with the smoke detector, this wasn’t a terribly successful dish. The broccoli wasn’t cooked enough and ended up being burnt by the “extremely hot” grill pan. Next time, I’ll steam the broccoli, then toss with the a couple of tablespoons of olive oil, the garlic and jalapeno and roast until browned and tender for 10 minutes in a 400° oven. Less mess and no juggling phones and smoking grill pans while remembering passwords! If you’re not grilling outside, I definitely think roasting in the oven is the way to go. I used a red jalapeno for contrast, but a green one would be fine. I hate it when I set off the smoke alarm. I almost did it last week when I decided to make hot apple cider before wandering off to my studio. The smell of burnt sugar brought me back to the kitchen to find the cat staring with fascination at the smoky inversion layers. I got the doors and windows open and the fan on before the smoke reached the alarm, thank goodness. I like your suggestion of roasting in the oven and this looks like it’ll be delicious with the jalapeno! Previous post: Soup-A-Bowl: A Fun Fundraiser! Next post: Gabriel Rucker at DeGustibus: Food & Fun!